If you want to get out and spend a day panning for gold, there are many places that you can go that don’t require that you own a mining claim or get any special permission. Quite a few locations in California have been set aside to allow for recreational prospecting opportunities. The places listed below are all free locations (some have a small day-use fee) that you can spend a day panning or sluicing for gold. It is always a good idea to check with each park or land management agency to get the latest rules and regulations for that area. This great location to pan for gold is 1 mile south of Auburn, California. It encompasses over 40 miles of the North and Middle Forks of the American River. Both of these rivers have a rich mining history and contain good gold that can be panned. Day-use gold panning and sluicing permits are issued for designated areas within the Butte Recreation area located about 25 miles northeast of Chico. Permits are issued at the Redding BLM office. This State Park is located 3 miles north of Sonora on Highway 49. There are a variety of activities for tourists relating to the gold rush in the area, including gold panning opportunities. 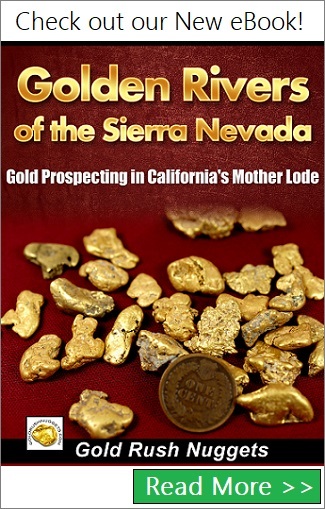 Gold was found at Keyesville on Greenhorn Creek, a tributary to the Kern River. 400-acres of the Kern River has been set aside by the BLM for recreational gold panning opportunities, which encompasses 1.25 miles along the Kern River. This area is located about 2 miles northwest of Lake Isabella. At the famous Malakoff Diggins you can go panning for gold along Humbug Creek near Nevada City. This was the site of one of California’s largest hydraulic mining operations. A location within the park is set aside for gold panning (hands and pans only) on the northeast banks of the American River across from the parks museum. Several businesses in the area sell gold pans and other basic prospecting supplies if you need them. There are several miles of the Merced River near Briceburg that are open to recreational gold panning within the Merced River Recreation Area. You can pan for gold along the South Yuba River within the Wild and Scenic section between Malakoff Diggins and Englebright Reservoir. Gold panning demonstrations take place at the park during the summer. Small-scale prospecting opportunities can be found it the Swasey Recreation Area near Redding. This area cannot be claimed, so there are historic gold producing areas where you can pan and find gold. The stretch of the Trinity River that is open to low-impact gold panning is within the Wild and Scenic area from Lewiston to Pigeon Point.